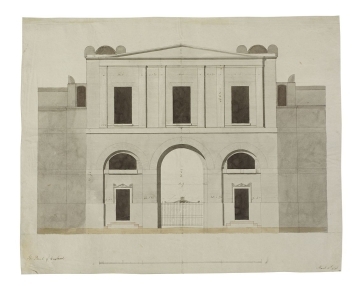 9 (Bailey) The Bank of England, Sketch of a Design for the Buildings on the North side of the "Lothbury Court", 1797 (verso) Mr Soane 10 The Bank of England and dimensions given 11 (Bailey) The Bank of England, Elevation of the Centre of the North side of the "Lothbury Court"
Drawings 9 to 11 are designs for the south side of the Porter's Lodge. 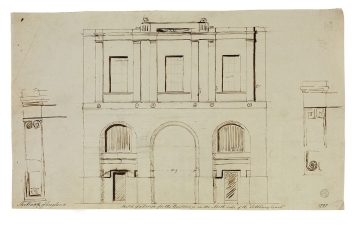 Eventually this side of the building formed the north side of Lothbury Court. 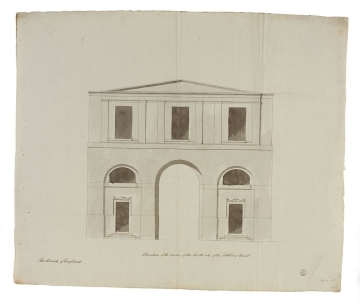 It is clear from these utilitarian designs, however, that the elaborate Court was not yet conceived.